Police are investigating several incidences of vandalism in San Francisco's Portola neighborhood as hate crimes, police said. San Francisco police Officer Grace Gatpandan said officers received a report Monday morning that the words "No more Chinese" were written in orange spray paint in five locations. 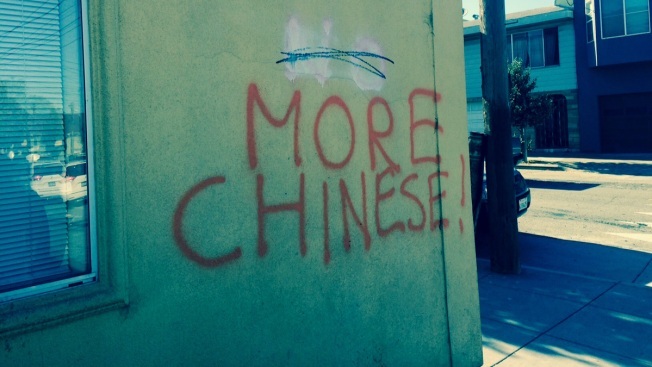 City crews had painted over the words by Monday night but resident Tommy Luk wasn't appeased. Deeming the hateful words a "major blow," he said, "I was disappointed." The words appeared to have been written on Sunday, but Gatpandan said investigators aren't yet sure exactly what time the alleged crimes occurred. The vandalism was reported in the 1300 block of Silver Avenue, the 500 block of Felton Street, the 100 block of Brussels Street, on an abandoned grocery store and on a Palega Recreation Center playground, Gatpandan said. Gatpandan said officers are looking for video footage from private security cameras in the area, along with any witnesses. Anyone with information about the crimes is asked to contact San Francisco police at (415) 575-4444 or to text TIP411 with the letters "SFPD" at the beginning of the message.